and continue to provide hundreds of school presentations to educate thousands of youth on bullying, dating violence and healthy relationships - to break the intergerational cycle of violence. Thank you again for making a difference for vulnerable families in our communities. Can we count on you to commit to joining us for one night of fun as we launch our Annual Giving Campaign? Every dollar raised at this event will go toward our goal of raising the $800,000 needed above our government operating grant to continue to protect women and children in crisis today and create violence-free communities into the future. Family Violence remains a significant problem in Alberta and the Foothills, and there’s still a long road ahead to achieving our vision: that every person is safe and secure and lives without abuse. Will you help us continue growing hope for the next 10 years? Tickets are $100 each or $800 for a Table of 8. Download our Sponsorship Package and Commitment Form to see more ways we can work together to promote your business and make a difference for women and children! Please join us for the 1st annual Breakfast with the Guys* - Foothills! Enjoy a networking breakfast, followed by a presentation by former Calgary Stampeder, Keon Raymond. Raymond will share his personal story of experiencing family violence and what it means to be a part of the Alberta Council of Women's Shelters Leading Change project. Then you'll be out the door and on your way back to work by 9am! When women reach out to us for help, it tends to be after the abuse has taken place. We work hard to support them in their journey to healing and continue to change the lives of many women and children. However, we strongly believe that prevention and education are what will create the cultural shift to ultimately end domestic violence. Violence and abuse are not issues that should stay behind closed doors - they are the responsibility of the whole community. So Rowan House is calling on the good guys to be leaders for change. If you are a leader in the community, Breakfast with the Guys is an opportunity for you to take small steps that will have a big impact. Together we can create a safer future for those who live with violence every day. These are women you know, in your workplace, on your daughter’s soccer team, around you when you are out with friends and those in the causes you support. *Please note, this event is not limited to men. All are welcome! 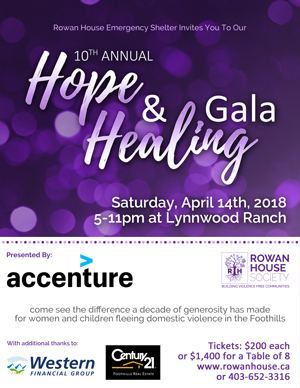 Rowan House is celebrating its 10th annual Hope & Healing Gala, presented by Accenture! Join us for an evening of great food, entertainment and fundraising as we celebrate the impact a decade of generosity has made. Saturday, April 14th, 2018, 5pm-11pm at Lynnwood Ranch in Aldersyde. Tickets are $200 each or $1,400 for a Table of 8 and proceeds go toward helping us raise $800,000 for our programs and services supporting families affected by abuse, both in-shelter and in the community. Sponsorship opportunities are also available. Email gala@rowanhouse.ca for details.